An historic hidden object adventure! 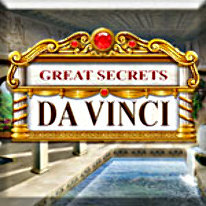 Play the part of the great Leonardo da Vinci! Embark on an exciting life-long adventure through his diary as you discover great mysteries within its pages. Meet his famous contemporaries, find new knowledge, and possibly discover the secret of the Philosopher’s Stone - which can turn anything to Gold! Don't miss the opportunity to not only become culturally enriched, but also to visit the most distant, secret, inaccessible or long-vanished places reflected in the pages of da Vinci’s diary! Enjoy your travels!